Oh, how we love a fast, easy-to-read, substantive book! 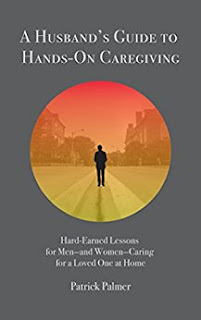 We were surprised to find that men as caregivers are somewhat overlooked. Surely, there are more of them out there? Regardless, Palmer offers a no-nonsense guide to helping your mate with end-of-life endeavors. Palmer tended to the needs of his wife when she was diagnosed with cancer. She outlived that and got sick again. She lasted a long time after her given prognosis and never complained during any of the endless treatments, injections and more. Palmer learned the importance of having a life outside of the house in which the dear couple resided, he learned on whom to lean and whom to separate himself from. to assist her father on this journey. It is incredibly painful. The somewhat-shocker? No matter how prepared you are, you are never really ready for the inevitable. A Husband's Guide...is a loving how-to. Patrick Palmer, a former airline pilot and YMCA CEO, chairs the Angela and Patrick Palmer Research Fund for Brain Cancer, which benefits the Center for Neuro-Oncology at Dana-Farber Cancer Institute in Boston. He lives in Newton, Massachusetts.